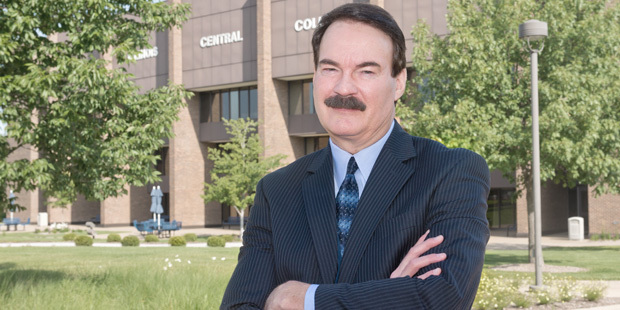 Dr. John Erwin retires as the College’s fourth president, effective Friday, May 1. Erwin served as president since January 1, 2001, when he replaced Dr. Thomas K. Thomas. Erwin has been contemplating retirement since early 2014. The decision to retire at this point in time was based on a variety of factors, including the circumstances surrounding his individual retirement plan. During Erwin’s administration, ICC was recognized for excellence and began several organizational initiatives. ICC was the first educational institution to receive the 2010 Silver Award for Progress toward Excellence from Illinois Performance Excellence (ILPEx). Illinois Central College’s library was recognized as the nation’s best among community colleges in 2014 by the Association of College & Research Libraries. Under Erwin’s guidance, ICC was one of the first educational institutions to fully embrace Six Sigma, a methodology for quality improvement. The College also was one of the first to embrace a quality-improvement approach to accreditation through the Academic Quality Improvement Program (AQIP) of the Higher Learning Commission. Erwin incorporated interest-based bargaining as a negotiation tool for ICC’s unions and bargaining units and expanded the use of strategic planning methodologies at the college as well. Erwin served on: Executive Committee of the National Junior Community College Athletic Association (NJCAA); Illinois Community Colleges Council of Presidents; CEO Roundtable; Methodist Medical Center Board of Directors; Peoria Historical Society Board of Directors; Wildlife Prairie Park Board; EDC Board; the Workforce Development Board and PeoriaNext. He received the George E. Killian Award of Excellence from the NJCAA; the Illinois Community College Trustees Association – 2010 Advocacy Award; the NCMPR District III Pacesetter of the Year Award; and the Shirley B. Gordon Phi Theta Kappa Award of Distinction recognizing administrative support of students. Erwin received PhD in American Studies and United States history and a Master’s degree in history from Indiana University. He is an ordained Methodist minister. ICC’s Board of Trustees is scheduled to meet on Monday, May 4, 2015. At that time it is anticipated that the Board will consider options for the future leadership of the college. A farewell reception will be planned for later this summer at the College. Congratulations and best wishes, Dr. Erwin!